Rev. 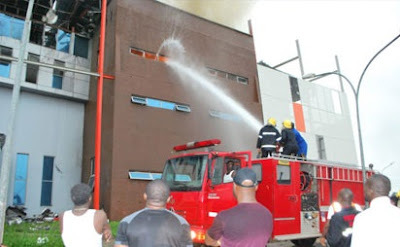 Kennedy Asigime, a cleric in the N3 billion House on the Rock Church in Abuja, which was gutted by fire on Sunday said that the Nigerian fire-fighters came with “the same ladder used by Electric Distribution Companies,”and with no water. Rev. Kennedy Asigime, a cleric in the church, told newsmen that there were no casualties as members of the church had gone home at the time of the event. “This whole building cost about N3 billion and a very substantial part of the building has been totally destroyed. “We cannot be sure of what is left standing now, we need to do an integrity test to know if the whole building is going to be knocked down,’’ Asigime said. “They were just here because they want to put it on record that they responded to the call; but they got here and said they did not have water. Until trucks from the private sector started coming, trucks from Julius Berger and NNPC, may God help us in this country,’’ he added. Moreover, the fire which gutted the House on the Rock Church in Abuja on Sunday began on the top floor of the N3 billion edifice, according to a witness. The church building, which is known as `Citadel and Towers’ with a sitting capacity of 10, 000, went up in flames at about 2pm as the rain was falling. The witness who identified herself simply as Esther said the fire began after the Sunday service had closed. She said she was about to leave the Church premises when she noticed fire on the top floor of the building. According to her, the plastic materials on the top floor of the building burned quickly, and spread to the second floor and onto the pulpit. Half of the building located on Airport Road was destroyed before the firemen were able to tame the fire. In his response, the Head of FCT Fire Service, Garki Station, Mr. Stanley Ujobo, said the cause of the fire could not be ascertained yet. “We cannot really ascertain the cause of the fire for now until we are done with dumping, which is pouring enough water to prevent resurgence. “A lot of combustible and very highly inflammable materials were used in partitioning the building. “Before you enter such a burning building, you have to take caution to avert loss of life; that was the reason we were unable to start fighting the fire on arrival,’’ he said. According to Ujobo, the building did not have fire hydrant and that the alarm system was not working. Ujobo said that the fire fighters were professionals trained to fight fire and would not rush into a building without proper strategy. Ujobo advised Nigerians intending to build such big structures to consult the fire service for professional guidance on what type of materials to use. Motorists and some members of the church who witnessed the fire incident from a distance were seen worshipping and singing praises to God for averting a bigger calamity. The fire service deployed no fewer than eight trucks. There were other private fire trucks that responded, before the fire was extinguished at 5.30 p.m.